(all of the Avalon Beach Sub Branch). Above: Prior to Victory in the Pacific (VP) Day Service 2011 Commenced and Left to Right: Leading Seamen Terry Stewart and Mark Bradbury, Neli Johnston (Sub Branch), Commodore Sloper (Rtd.) and Acting Sub- LT (Rtd.) Andrew MacGregor. A member of the Avalon Aviators (a group of gents who meet at Ibiza, Avalon each Wednesday, and whom we shall bring you more on in May), and a Pittwater man with a passion for the air and the craft that may fly through it is Neil Johnston. Despite descrying his association with all things in aviation his log book shows 50 years in General Aviation and re-introducing sky writing (aerial advertising ) in the mid 1980's to Sydney. As a flying instructor, Warbird owner and display pilot, Neil Johnston is a man we think of as Autumn brings in its clear crystal skies. I was born on the 8th October 1943 at Leura, NSW. We lived there for the first 4 months of my life then our family moved to Balmain where I lived until I was 24 and then married and had two children. I was educated at Balmain, Rozelle and then Drummoyne High School. I had an early interest in aviation and would work at the Royal Aero Club at Bankstown on the weekends assisting with the refuelling and getting approval after strict instruction on hand swinging the propellers on the club Tiger Moths and Chipmunks. I subsequently learned to fly at 16 years of age. Arthur Kell DFC (Distinguished Flying Cross)and Bar ex 617 Dam buster Squadron was my instructor. Sadly Arthur and his student died in a training accident near Bringelly NSW a few years later; unbelievably a two shilling coin became lodged in the control column and they were unable to recover from a spin training exercise. I had set my sights on joining the RAAF however this was not to be after passing the entrance Exam and going before the Selection Committee, I failed the ophthalmological test due to colour blindness. My sights were well and truly set to join the Armed Forces and I thought this "colour blindness" is not going to beat me. I purchased the Ishihara co., the test book that the medicos use and learnt it thoroughly to cheat. I applied for the Fleet Air Arm, thought it would be fun flying off our Aircraft Carrier (The Melbourne). I did the same entrance exam again, passed and was sent to the same doctor again to find my version of the colour blind book was a different addition to his. They do this to thwart the cheats !! I joined the CMF. 1RNSW REG (cdo) at Georges Heights Mosman. After being disappointed with the outcome I started work at Lanock Motors William Street as a Cadet and worked with the company in various roles for 12 years before going into business for myself. Meanwhile my flying continued. I moved on to a Commercial Licence and a Honorary flying instructor for the Scouts Association at Camden Aerodrome with aerobatics instruction and low level approval and the odd charter flight. At Schofields Aerodrome Airshow 1981 I was lucky enough to meet Douglas Bader and Douglas Bader met for the first time Max Meyer, the German who allegedly shot Bader down in a Bf109 amazing ! I was a part time flying instructor and reintroduced aerial advertising (skywriting) back to Sydney during 1985. I operated out of Bankstown; it must of been somewhat alarming for other aircraft holding to take off when I got permission to do a 3 second smoke test on the ground and enveloped the surrounding area and myself in smoke !! Sydney controllers would often ask what I was going to write, at 13,000 feet and on oxygen over Sydney it felt strange watching commercial aircraft thousands of feet below me descending into Sydney Airport. My passion has always been Warbirds and Classic airplanes. In Year 2002 I was lucky enough to purchase an ex RAAF Commonwealth Aircraft Corporation Winjeel which I found very exciting and displayed at Airshows etc. 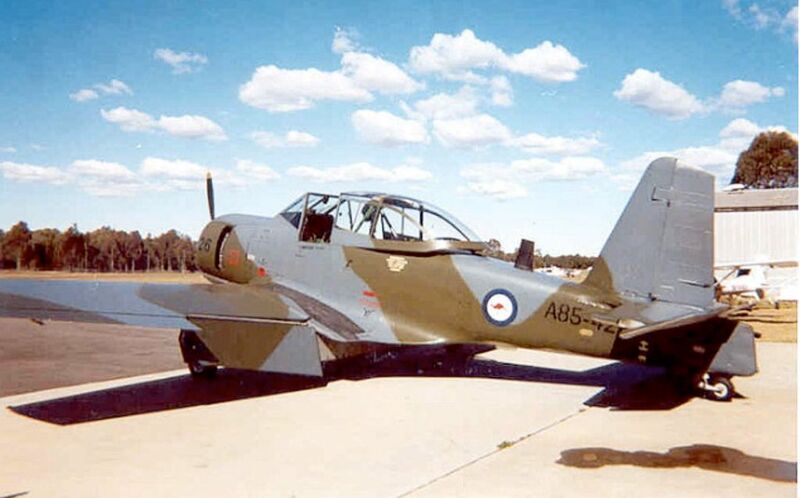 It had almost 40 years of RAAF service and was ex 76 Fighter Squadron based at Williamtown NSW. It was used to train pilots for FAC (forward air control) for Vietnam and was painted in camouflage and still had the smoke grenade dispensers fitted. In 1994 the Dealership Murphy Johnston was sold to the Bill Buckle family on the Northern Beaches and I stayed on as Manager with various with brands until retiring in 2007. I am currently a Committee Member of Avalon Beach RSL Sub Branch and a volunteer with the NB Cancer Council of Aust. What is the most memorable flight you ever made ? My most memorable flight ever made I think was just before I went solo in a de Havilland Chipmunk, I was 16 years old, returning from the training area to Bankstown at 1500 feet, my instructor was sitting in the back and removed the rear control column and tapped me on the shoulder with it and said "you'd better make this a good landing me boy....." I had know idea that the rear control column was removable !! If you could be a bird for a day, what kind would you be and where would you fly ? I would like to be a pelican, I would fly low over Pittwater and land like the de Havilland Beaver floatplanes slowly touching down. The RAAF has legendary status and is accorded much respect as one of our premier Australian Services; what does being part of this mean to you in owning one of their planes ? On the 22nd October 1912 Australian Flying Corp. placed orders for two B.E.2a, two Deperdussin and a Bristol Box Kites to equip the new Air Arm. To be a owner of an ex RAAF Aeroplane that has almost 40 years of service and was a part of Australia's Aircraft Manufacturing Heritage, to be able to show it still flying to the public was indeed a honour. Favourite place in Pittwater is to put the "rubber ducky" in at Clareville Beach and to go over to the western side to secluded Portuguese Beach, for a picnic.....Doesn't get any better !!! What is your 'motto' for life or a favourite phrase you try to live by? I think the Hebrews may have it right with their drinking toast "Lahaim" which means "To Life." Try and have more fun, laugh and be merry. The Deperdussin Monocoque was an early racing aircraft built in 1912 by the Société Pour les Appareils Deperdussin, commonly abbreviated "SPAD".